Period dramas are all the rage in Korea at the moment, but while some have been setting records at the box office (such as Roaring Currents), not all have been successful. No film is a guaranteed hit but period productions are a costlier gamble than most and with those risks come certain strings. 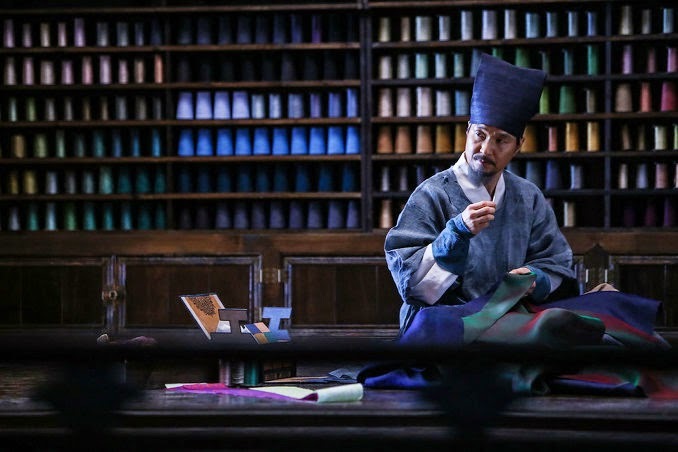 The Royal Tailor, a King’s court drama with a penchant for colorful fashion and plenty of humor, is a fine sophomore effort from Lee Won-suk, if one that feels bound by certain restrictions and obligations, particularly in its final act. Dol-seok is the official royal tailor and after decades of service, nobility is finally within his grasp. Praised by the new King for his fastidious technique and traditional garbs, there appears to be no obstacle between him and his title. That is, until a cocksure and unorthodox young tailor enters the picture. The Queen, who is all but estranged from her husband, takes a keen interest in his work and eventually the tailor himself. A rivalry ensues between the tailors which before long begins to affect both the King and Queen. Lee brings along the vivacious style of his zesty romcom debut How to Use Guys with Secret Tips (2013) to this charming period romp that finds humanity in its timeworn tale of King's court jealousy. Despite a present day opening scene that introduces the main character of this Joseon era tale, historical accuracy is quickly dispensed with, in favor of an anachronistic setting and irreverent tone that allows Lee to tell his story with modern humor and through the lens of contemporary society. It's a risky gamble but with its slick and iridescent production style and some game supporting actors, the table is set for an engaging tale of brotherhood and court intrigue. The first hour, with its ample humor, snappy editing and strong tempo, is a breeze and Lee manages to up the stakes very smoothly when the relationship dynamics of the story begin to shift and intensify. The problem comes a little ways into the second hour, when the plots thickens further, ushering in a darker tone that no longer affords any space to the chicanery and levity of the preceding sequences. As the royal tailor, top 90s star Han Suk-kyu (Christmas in August, 1998) brings a quiet vanity and uneasy confidence, which gels well his character. He lacks the comic timing of some of his co-stars and his range of expressions is a little wanting, yet these drawbacks are negligible for a part that largely remains neutral. As his younger and far more animated foil, Ko Soo (The Front Line, 2011) is suitably cocky and charming. Though he lacks the kind of magnetism that would really make the role pop, Ko bounces well off Han, which becomes a valuable asset as their bond develops. As the monarchs, Yoo Yeon-seok (A Werewolf Boy, 2012) makes for an appropriately brash and conceited King while Park Shin-hye (Miracle in Cell No. 7, 2013) doesn’t quite manage to bring depth to the Queen. This leaves a lot of the heavy lifting in the very capable hands of court officials played by Ma Dong-seok (One on One) and Bae Sung-woo (Way Back Home, 2013). They’re given a lot of the laughs and are responsible for much of the energy in the first half. Yet the main reason the film ticks along so well early on comes down to director Lee’s excellent control of the material. He has a natural sense for color, timing and staging, and cleverly manipulates shot structure, music and editing to get the most out of the screenplay, written by Lee Byeong-hak. When the film moves into its protracted final act, the usual melodramatic cracks begin to show, and despite his best efforts, Lee is unable to resuscitate the humdrum resolution with his impeccable films style. It’s a fine ride up until then and even though some good moments dot the final scenes, the danger is that the film’s weaknesses and its very disappointing box office returns will overshadow Lee’s evident talent. 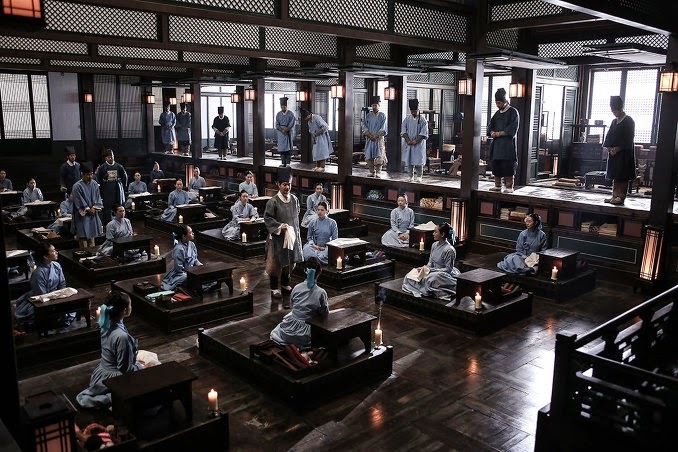 Even with its problems, The Royal Tailor was the best Korean period film of 2014 and I hope it won’t be long until the silver screen can welcome a new work from the very talented Lee.